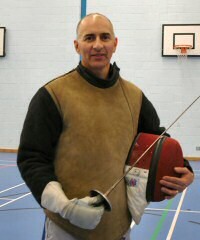 Wimbledon Fencing Club trains juniors from age 10, and offers them the opportunity to progress by fencing adults in the club as they gain in experience. This course will run as part of the Junior training programme, and will be covered by the Junior membership fee for the term. Foils, jackets, plastrons, gloves and masks will be provided. Participants should wear a short-sleeve T-shirt, stretchy (track-suit) trousers, and trainers (with clean, light-coloured soles). There are good changing facilities and showers. There is a drinking water fountain nearby, but fencers are advised to bring their own bottled (still) water for convenience. If you would like to enrol in this course, please print, complete and return the Junior Membership application form, with payment, to the Club Secretary. For further details contact us via our on-line query form.